One more hat for the road. 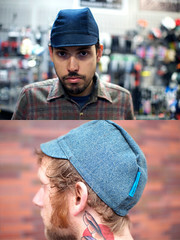 This is the Denim Workmen's cap from TrackosaurusRex. They say they, "wouldn't call it a cycling cap but it's pretty damn close." Close enough for government work. It fits under the helmet, and fits with Dapper Dan's sense of style. Reminisce over posts from the recent past and you'll find myriad options to cap your lid through all four seasons.